Climate modelling is a field in rapid development, and the fltudy of cryospheric processes has become an important part of it. On smaller time scales, the effect of snow cover and sea ice on the atmospheric circulation is of concern for long-range weather forecasting. Thinking in decades or centuries, the effect of a C02 climatic warming on the present-day ice sheets, and the resulting changes in global sea level, has drawn a lot of attention. In particular, the dynamics of marine ice sheets (ice sheets on a bed that would be below sea level after removal of ice and full isostatic rebound) is a subject of continuous research. This interest stems from the fact that the West Antarctic Ice Sheet is a marine ice sheet which, according to some workers, may be close to a complete collapse. 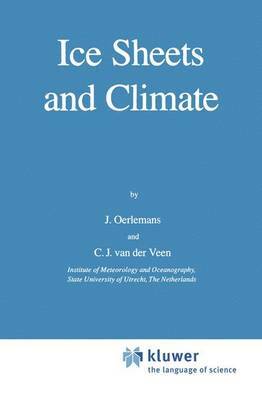 The Pleistocene ice ages, or glacial cycles, are best characterized by total ice volume on earth, indicating that on 4 5 large time scales (10 to 10 yr) ice sheets are a dominant component of the climate system. The enormous amount of paleoclimatic information obtained from deep-sea sediments in the last few decades has led to a complete revival of iriterest in the physical aspects of the Pleistocene climatic evolution.